Basic computer maintenance is easier than most think. 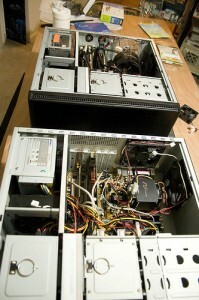 Service companies such as Geek Squad and other computer services charge obscene amounts of money to do basic system maintenance. These service companies perform tasks that anyone can do. A few simple clicks will save consumers hundreds of dollars that might have been spent on a limited computer examination and repair. Some services should be left to the professionals, but the majority of problems encountered on a computer can be solved by anyone with a mouse and keyboard. Provide free computer maintenance by following a few easy steps. Old Programs – Only keep programs that are necessary to users on the computer as a part of basic computer maintenance. Old programs take up space and some of them run in the background using RAM which results in slower performance overall. Go to the control panel and find “Add or Remove Programs.” A good idea is to sort the programs by the day last used. Choose to uninstall any old programs that will not be used in the future. Uninstalling will remove most of the files associated with their respective programs. However, commonly there is space still being used on the hard drive for these programs. To remove this wasted space run a disk defragment on the appropriate hard drive. RAM – Random Access Memory is what runs all that you see on the computer screen. All programs and applications use RAM to run. The most common reason for a slow computer is not enough RAM. Computer repair shops will tell customers that they need more RAM to have a faster computer. This is true but not always necessary. Monitoring RAM usage is a way to avoid having to buy more RAM. Running too many programs at once can slow down a computer. This is because there is not enough RAM to run all those applications at once. Control-Alt-Delete and navigate to the task manager. Click on the “Processes” tab and sort by memory usage. Search Google for the processes that seem unfamiliar and decide whether or not to end them. Start up times on computers slowly get longer and longer as time goes on and more applications are installed. Click “Start” and type “msconfig” into the search box. Start the msconfig utility. Navigate to the tab that displays start up programs. Only select the most necessary programs that must run when the computer boots. Updates – A large part of basic computer maintenance relies upon up to date programs and applications. Anti-virus software that does not receive updates is useless. Therefore updating is just as important as any computer maintenance task. Schedule Windows updates regularly to protect computers from the most recent threats. Keep hardware drivers up to date as well. A common fix for slow graphical applications is to update video drivers. Search the video card manufacturer website for the most recent drivers and install them. This advice also pertains to all other hardware. Hard Drive Space – Users that do not remove unnecessary programs and files might be at risk for low hard drive space. An easy fix for this is to go to the control panel and open “Add or Remove Programs.” Follow the same directions in step 1 (Old Programs). Basic computer maintenance is simple and much easier than most think. Performing computer maintenance at home allows users more control over their systems. It saves money and takes less time. Basic computer maintenance is just a click away.